Fueling for performance requires knowing what foods to choose and when to have them. Dr. Sears has worked with elite athletes his entire professional career and his recommendations are based on years of seeing what has led to the greatest improvements in becoming faster, stronger, and leaner. You don’t have to be an elite athlete to use this guide. No matter your fitness level, use these recommendations to reap the most from your workout and enhance how quickly you can get to your next one. When: 30-45 Minutes Before and During Exercise. What To Do: Eat a Zone snack 30-45 minutes prior to exercise. Half of a ZoneRx bar is an ideal choice. Why: Consuming protein helps to minimize muscle damage and stimulate glucagon synthesis to elevate blood glucose levels that will fall during exercise. Carbohydrate consumption helps spare muscle glycogen that will be depleted and maintain blood glucose levels that will be lowered during exercise. What To Do: Eat a Zone snack immediately following exercise. Half a ZoneRx bar would be an ideal choice. Why: The combination of protein and carbohydrate helps to replenish muscle glycogen and initiate muscle repair. 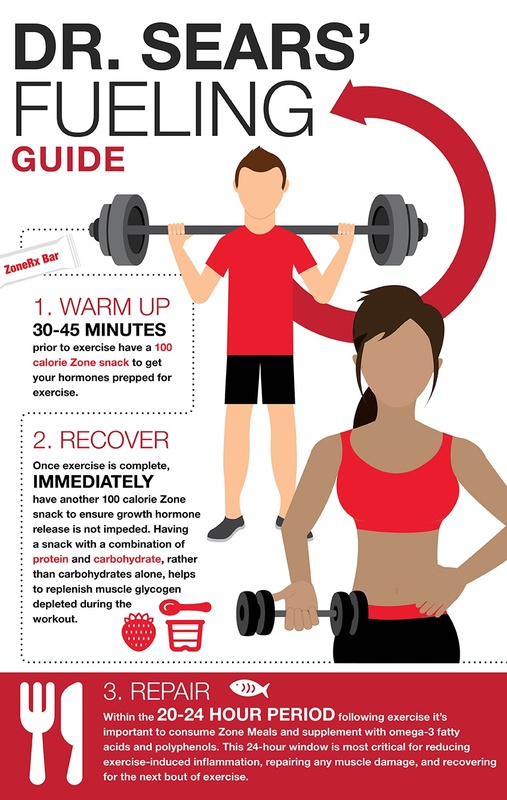 Growth hormone is released once exercise stops to initiate repair and this can be inhibited by high levels of insulin. Where carbohydrates alone could impede the release of growth hormone, the combination of both protein and carbohydrate helps to ensure this release happens quicker. 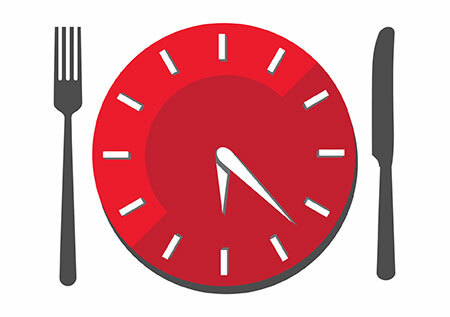 What To Do: Consume a Zone meal or snack every 4 to 5 hours. Ensure each meal contains at least 25-30 grams of high quality protein. Aim for lean protein choices that contain leucine, an amino acid found in foods such as chicken, lean beef, pork, fish, seafood, and cheese. Consuming about 2.5 grams of leucine helps activate mTor, a gene transcription factor required for new protein synthesis. Balance your protein with non-starchy vegetables at each meal. This will help to control insulin levels between meals and when balanced with the right amount of protein will help stabilize blood sugar levels. Supplement with omega-3 fatty acids and polyphenols. Why: The combination of the Zone Diet, omega-3 fatty acids and polyphenols helps maximize the anti-inflammatory response that results in tissue repair post-work. Depending on your sport you might be trying to gain weight, primarily through lean body mass, or to lose body fat while maintaining lean body mass. Either way it’s important to know how much protein you should be consuming each day. To find your personalized requirements based on your gender, size and weight, try our Protein Requirement/Body Fat calculator. This will also tell you how many Zone Food Blocks of carbohydrate and fat you should consume each day to go along your protein requirements. The following menus are based on Dr. Sears' work with Olympic athletes. No matter your fitness level, used this as a guide and simply adjust the amounts based on what you've determined your protein requirements to be. Get started here with our meal planners for both males and females.